Prayers are needed for all those who are being put to death in the world. I can’t help but wonder as Americans that we are use to our comfy ways. Many doesn’t understand how horrible things are for those who are being persecuted and imprisoned for their faith. Voice of the Martyrs have been working with those who are imprisoned. As a Christian, I find it horrible to know that my brothers and sisters in Christ are being killed. For more information, click here…. Pastor Saeed is just one of thousands of Christians that are being put to death and persecuted each day. While we live our life and sleep in comfy beds, these people are sleeping in cold jail cells and have little if anything to eat. During this very painful time of suffering, can I really say that my suffering was good for me? Can I say that it is good when it hurts so much and my kids are hurting every single day? 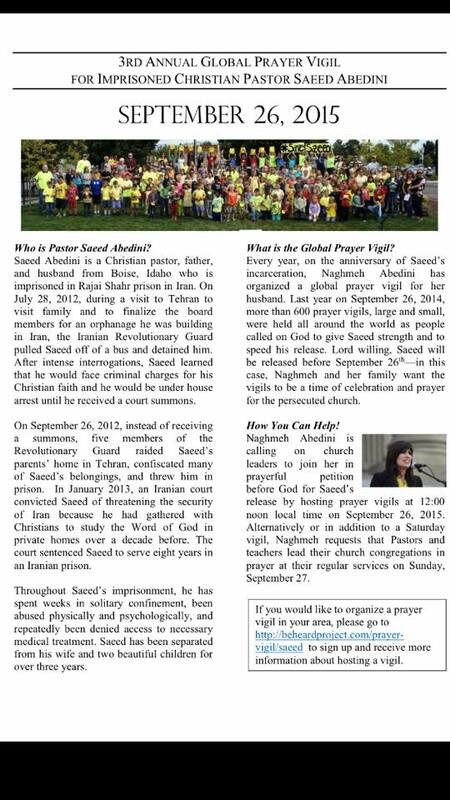 Can I say it is good when Saeed continues to waste away in the Iranian prison because of his faith? Yes! Because my suffering has caused me to cling to Jesus and to His Word and to desire to want to know and follow His “decrees.” In the next few days I will go through the decrees that the Lord has been bringing my attention to? Are you suffering today? It is the Lord calling you to go to Him and to pay attention to His decrees which will be the source of blessing in your life. Cling to Him today. Cling to His Word. Decide to obey His Word despite the cost.